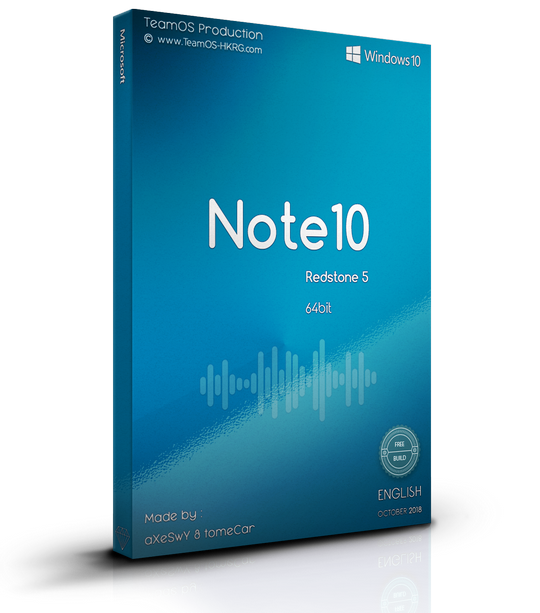 Torrent + Direct - Note10 [ Win10 Rs5 Pro X64 ] :axeswy & Tomecar: | Team OS : Your Only Destination To Custom OS !! This build have big size coz it have many programs in it.. about 3.5GB of various programs.. it is untouched build.. you can update it without any problem!! People ask and you provide. Lots of goodies in there as well. I'm going to really enjoy this build from the three of you. Excellent work @tomeCar , @aXeSwY and @Nickyseb . 1 seeder 10 leachers and free leach. Need I say more? Have to be dumb to not be all over this. Download torrent "click"
Three seeds and one more coming soon. No more complaining about seeds and download speed. Need I say more? I am downloading it to to seed only. Also thank you for this great work. @Mr. Spacely I'm pretty you misunderstood me. I was saying 1 seed and 10 leachers plus free leach is good. It wasn't a complaint on the contrary. I was more than trilled to get a swarm with some peers needing the file to bump up my ratio. You follow??? another great thread from axewy-tomecar, thanks for your great effort, can i create this like u? Nice build, thanks & great job both of you are doing. Could you please make a build with a newer theme for Windows 7 as well? Great Work !!! Tanks very much !!! Gran Trabajo !!! Muchas Gracias !!! The theme looks awesome. I just wanted to know is there a way to use this themes separately on other custom windows 10 .